Since it’s a holiday week, and I’m trying to get some deadline-induced writing done, I thought I’d share a post from the first week of 2014. Happy 2015! The following post (slightly edited) was originally published on January 3, 2014 . Naked Specs is a brand new online optical store that sells prescription glasses and polarized sunglasses. 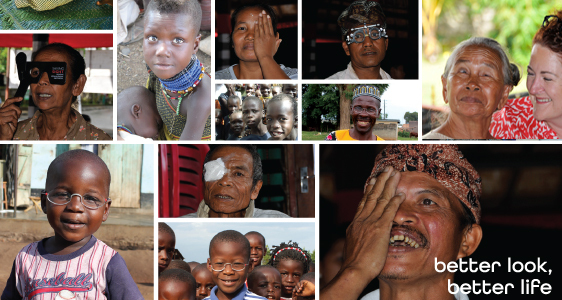 They also have a community giving program that aims to bring clear vision to 10 million people on the planet. Founded by Carol Pearce in Perth, Australia, Naked Specs gives customers the opportunity to shop for glasses with a conscience. Products start at $90 and shipping is free worldwide. Many have heard of the “buy one give one” business model. Naked Specs donates five pairs of products or the equivalent funding amount for treatment, such as cataract surgery, when a purchase is made. Customers choose which charity or project to support at checkout. Naked Specs came about after Carol felt a misalignment in values with the corporate organization she used to work for. This misalignment made her think about what she wanted to do next and what she wanted out of her career. She knew she wanted to make people feel good in some way and that she wanted to start a social enterprise that would help the less fortunate people in the world. Her son has a visual processing disorder and another family member has compromised vision as a result of disease. When Carol learned of the statistics on visual impairment and blindness in the world, she knew she wanted to help. Online statistics showed her that 285 million people around the globe are blind or visually impaired and 80% of the reasons for these impairments are in the curable or preventable area. It is important to Carol that Naked Specs’ giving is completely transparent (or naked). The company is monitored by B1G1 to ensure that the charities and projects that Naked Specs supports are completely vetted. Naked Specs is also dedicated to providing high quality and unique glasses to its customers. Carol explains that the glasses bring color and styles that people don’t normally find in an optical store. For example, you’ll find glasses on Naked Specs with bamboo material and layered colors. You can even see what the glasses will look like on you with their “virtual try on” feature. Maybe it’s because I vacationed there during my childhood years, but the Cape Cod sunglasses catch my eye. Reaching 10 million people through Naked Specs is Carol’s “big hairy audacious goal.” But she knows it’s achievable, even if it does take a few years. Which Naked Specs collection and/or charity catches your eye? I do vaguely remember this from last year. Right now still don’t need glasses, but do have a feeling I will need at the very least reading glasses as I get older knowing my family’s own history with this. So, will definitely have to keep in mind. Thanks for sharing again, Jennifer. Something I need to check out. Looks like very cute frames! I remember this from last year. 80% in curable or treatable area? So sad that I’d never even really thought about this. Not before you posted this. Tamara recently posted..I Want To Be With You Night and Day. good to know – worthwhile for sure. We take for granted a lot of the opportunity we have here for healthcare, don’t we? I love projects like this. When I need a new pair of glasses, this’ll where I’ll look. It’s pretty mind blowing how many people in third world countries suffer from blindness or some kind of vision impairment. Vitamin deficiencies play a huge role in that. I’m sure you’ve seen the documentary about one man going to a country and helping thousands of blind people see again… I can’t remember the name of the documentary at the moment.